The comic asks the question whether Halloween is just harmless fun or should we be concerned by it. It explains the history of Halloween; the mixing of pagan beliefs in the afterlife, the superstitions and fears that became entwined with it over the years and how it has become so popular. This value pack contains 10 copies of Professor Bumblebrain's Absolutely Bonkers: Halloween. Halloween is a short comic designed to engage 7-11 year-old with how Halloween started and what it is really about. Designed to give the message of light rather than darkness this is suitable to give to trick-or-treaters or church youth groups. Andy Robb looks at the parable of the wise and foolish builders and how putting your trust in Jesus is the best way to live. Colourful and amusing illustrations bring this comic to life and are suitable to give out at children and youth groups who may be covering the topic of Halloween. Andy Robb is the author of the 50 Bible Stories series and has a passion for communicating the Gospel to children of all ages. 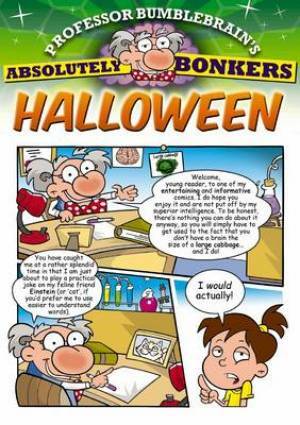 Professor Bumblebrain's Absolutely Bonkers Halloween (Pack of 10) by Andy Robb was published by CWR in January 2012 and is our 12545th best seller. The ISBN for Professor Bumblebrain's Absolutely Bonkers Halloween (Pack of 10) is 9781853456558. Be the first to review Professor Bumblebrain's Absolutely Bonkers Halloween (Pack of 10)! Got a question? No problem! Just click here to ask us about Professor Bumblebrain's Absolutely Bonkers Halloween (Pack of 10). Hi, I would like to purchase a copy of this comic for my daughter but can't find it anywhere to buy individually. Is it possible to open a pack & give a single or pack option to purchase? Thank you. A:Thanks for your question. We only sell the Professor Bumblebrain's Absolutely Bonkers Halloween in packs of 10. To view our full range of Children's Seasonal books, please see the link below: http://www.eden.co.uk/shop/browse.php?category_id=717&availabilitylist=1 I hope this is helpful!